The program places an emphasis on the experiential process of creating media (e.g., apps, games, films, websites, etc.) that is important to students and connected to activities they naturally participate in as part of their subculture. Deconstructing Familiar Media. Through the process of deconstructing video games, apps, and other relative media, students are guided through a thorough analysis of the products they use daily. Learning Skills and Languages of Media. 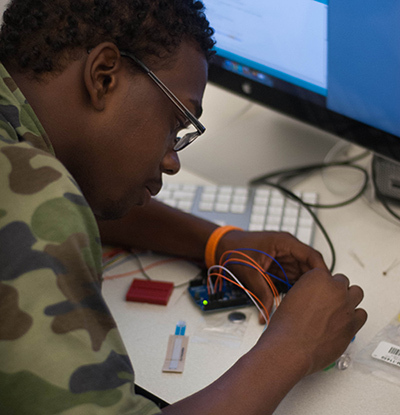 Students gain hands-on experience with a variety of digital media skills such as coding, video editing, web design, circuitry, and game theory by working on multi-faceted collaborative projects. Shifting from Consumer to Creator. The process of engaging in discussing, deconstructing, and making original media products through hands-on media making projects shifts students’ awareness from being a consumer of media to being a creator.